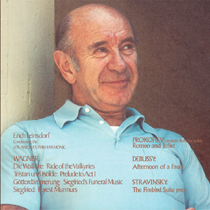 Sheffield Lab Recordings is proud to present a two-disc centennial tribute to Erich Leinsdorf in his highly acclaimed recordings with the Los Angeles Philharmonic Orchestra. Engineered by Doug Sax and recorded in the rich acoustical environment of Stage One, MGM Studios, these recordings were made with a classic stereo microphone technique. Originally recorded direct to analog discs and remastered by producers Doug Sax and Lincoln Mayorga, they capture an historic collaboration between conductor, orchestra, and production team.